I would like to introduce you to my family. 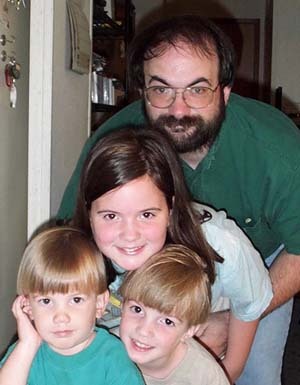 I have three wonderful kids, Tori, Kevin, and David. They are all unique and fun to be around, each in their own way. We are all getting to know/understand our new relationship as a family of divorce. Most of the time, I try to view us as simply a family. Usually that works. In any case, feel free to visit each of us on the pages to the left. Please be warned that most of these have some pictures, so if you are on a slow link to the network, it might take a while.